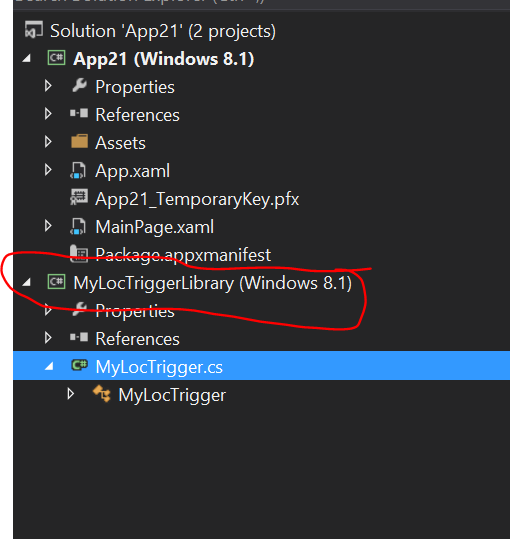 I’ve been trying to track the ability of a Windows 8 Store application to do work in the background since the first previews of Windows 8 shipped. 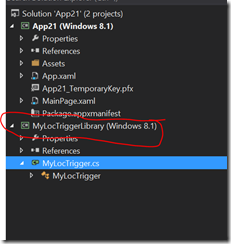 The idea that a Windows Store app is more than the UI that you see on screen is a really interesting one and, for me, it’s important to understand that area reasonably well such that you can decide what a Store app can/can’t do and how to put in place an architecture that allows code to run in the right place at the right time. This is explained up on the developer centre and I’ve posted about certain aspects of it in the past. 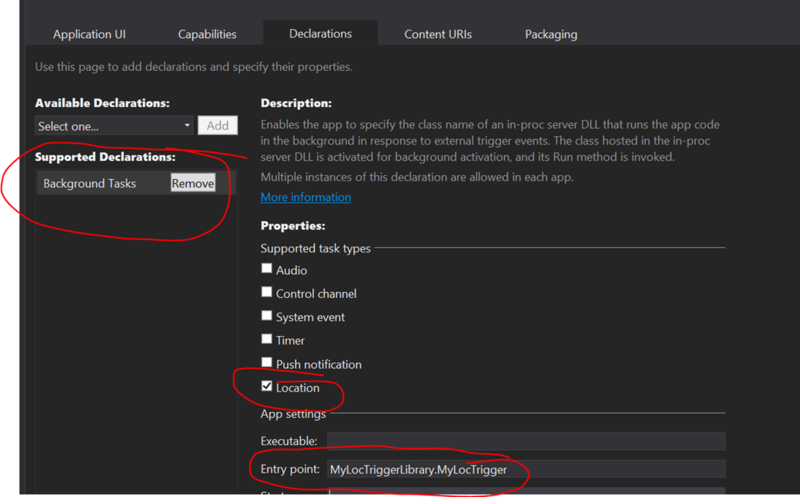 One of the new types of triggers that arrived in the Windows 8.1 Preview was a LocationTrigger – a way of triggering activity when the machine’s location changes or “geofencing” as it seems to be known. Running background tasks in response is just one part of the new geofencing support in Windows 8.1. It’s worth having a look at the “Start to Finish” guide up on the developer centre to get a bigger picture view of geofencing and it’s also worth look at the BUILD video referenced below for more info. It’s not too hard to think up scenarios – e.g. it might be used in a line-of-business scenario to download some kind of work items when a device enters/leaves a particular location such as for a delivery messenger or a travelling salesperson or whatever. The build system errored if I tried to build my app without specifying that I am lock-screen capable because I had used a location trigger. The build system errored if I specified that I was lock-screen capable and had used a location trigger because it told me I needed to use a “control channel, system or push notification” trigger. I wonder if I’m missing something or whether this is just “a preview thing” so I tried to fool the build system by claiming that I also supported a “Timer” task and that seemed to pacify the build system even if at runtime I’m not actually going to implement a task that is driven from a Timer trigger. I hacked some code together (no nice patterns, design, MVVM or even a nice set of classes) behind those buttons. The “new fence” button changes the mouse cursor to a cross-hair, lets the user click on the map and drops a 1km geofenced area wherever the user clicked. Just so I could see what I was doing I made the system’s current location appear on the map as a Pushpin with the letter “C” (for centre) in it and I made each geofence have an incrementing id which is also displayed on the map. 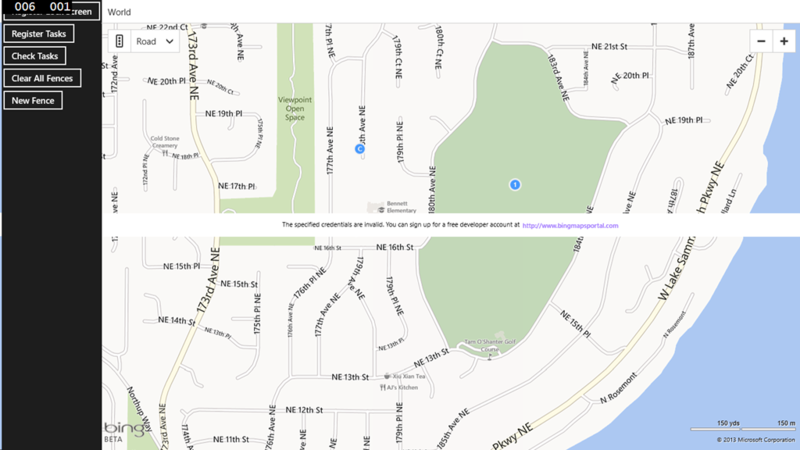 So, in the above screenshot the machine is centred in Seattle on 178th Avenue NE and there is a geofenced area in the golf course to the East. // If we are in "drop a new fence" mode. // Clear the mouse pointer that we changed. // Ask the map where the user clicked. // Omitting altitude right now. // Ask for a 1km fence. // Add it to the list of monitored fences. and so the handler essentially gets the mouse click position from the map in lat/lon coordinates and then creates a BasicGeoposition, uses it to construct a Geocircle with a radius of 1km and uses that to create a Geofence which is monitored for the machine entering/leaving it (line 27), multiple times (line 28) and the machine has to be in/out of that area for 5 seconds minimum in order to trigger the geofence (line 29). That Geofence is then added to the list of Geofences that the system is monitoring on my app’s behalf (this list can easily be retrieved later and interrogated, cleared, etc). For the moment, I added some dummy code into my background task implementation and then set about trying to test this out. This proved hard. You can’t request lock-screen access from an application that’s running inside of the simulator so I think you first have to run the app outside of the simulator and get it on the lock-screen. I’m not 100% sure on this but, as far as I could tell geofences that I set up outside the simulator didn’t seem to show up inside the simulator so I found that I had to set up my fences inside the simulator. Periodically, I would get a catastrophic failure error back from the call which registers my background task. Once that happened, I found that I had to reboot to clear that error and get my task registered again. But I came across a bit more of a blocker. 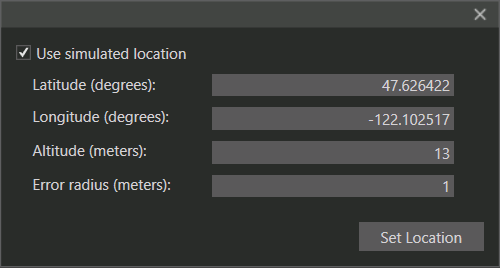 In as much as I could tell, changing the simulated location in the simulator did not seem to ever trigger my background task which was waiting on its LocationTrigger. I wrote bits of code that sync’d up to the GeofenceStateChanged event on the GeofenceMonitor class to try the scenario where an application wants notification of geofencing events while it is the foreground, running app and I would find that I could change the simulated location of the device such that these foreground events would fire when that location entered/exited a geo-fenced area so the bits seemed to be working. 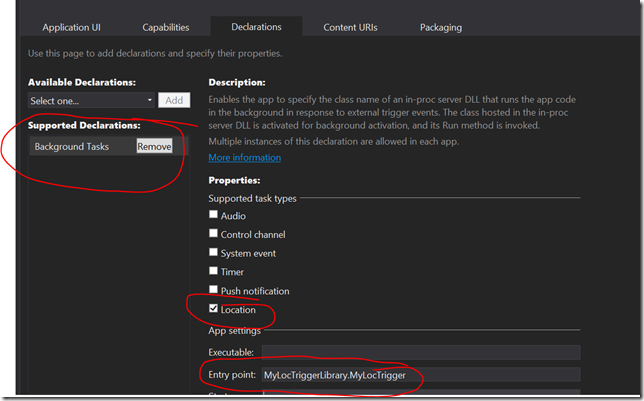 However, I couldn’t get a background task to fire on a LocationTrigger. I went and found the official geolocation sample and that turned out to have geofencing added to it also with background tasks associated with a LocationTrigger but I couldn’t get that sample to work for me in the simulator either. Getting a bit desperate, I did a bit of a web-search and found a bug report which suggested that things might not work. I asked around a little and found that there is a limitation – simulating a geo-location in the simulator works fine if you’re handling notifications in the foreground but if you are using the new LocationTrigger and trying to trigger a background task based on entering/exiting a geofence in the background then the simulator isn’t going to help in that respect – those triggers do not fire based on changes to the simulated location in the simulator. 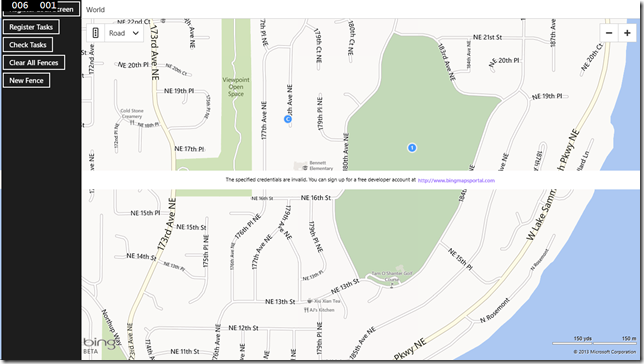 I thought I’d change my test code such that rather than setting up a 1km geo-fence area it allowed me to set up a 50m geo-fenced area and then I figured I’d install the app onto my Surface RT (also running Windows 8.1 Preview) and then set up a 50m geofence around my current location before walking up the road until the device “knew” that it was no longer within that 50m geofenced area and then I’d expect an “exiting” event after I left the area and an “entering” event when I came back into the area. Naturally, this is a bit hit-and-miss with the Surface RT because it’s not a device that has GPS making it exactly aware of where it is at any time – you have to hope that it has some other way of figuring out that its location has changed and, in my case, that did seem to be happening and I can only assume that the device was doing this based on the WiFi networks it could/couldn’t see. I experimented with this but, to date, I’ve had no success. I’ve not seen a background notification on my device actually fire. I can walk far enough (i.e. a few 100m) up the street such that the device clearly knows it is more than 50m away from the geofenced location (I can see this using both my own app and the built-in Maps app on Windows) but I never see my background task get invoked. So, at the time of writing I’m still waiting to verify whether I can get this to work – perhaps it’s a “preview” thing or perhaps it’s something wrong with my hacked together test code. Speaking of which. // Scrub that - for "in the street" testing, I want a 50m geo-fence. So far, I’ve failed to get this LocationTrigger->Background Task scenario to work for me with setting up geofenced areas and then entering/leaving them. I’ll return to it when I’ve moved to Windows 8.1 RTM and see if I have more success there but it’s worth being aware of this new capability and perhaps trying it out for yourself and see if you can get the SDK sample to do the right thing with respect to background tasks and geofenced areas.